Haven’t heard about Virtualization yet? Well today’s your lucky day. Virtualization, in computing, is the creation of a virtual (rather than actual) version of something, such as a hardware platform, operating system, a storage device or network resources. So basically you can have a computer inside a computer. This can really come in handy for many reasons from just basic testing to enterprise level user management and backup. Many end users such as yourself are using virtual machines because they allow you to almost instantly restore you computer to its previous state if you get a virus or accidently press the wrong button and the computer suddenly stops working. Or how about that blue screen of death? Wouldn’t it be nice if you could have your computer up and running again in 5 minutes and for free rather than paying someone like me to come out and fix it at $100/hr.? 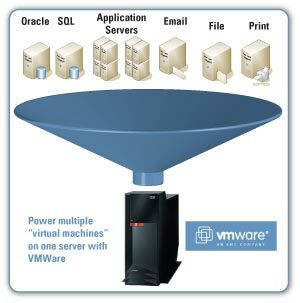 There are many different companies out there today creating virtualization platforms, but the original and most popular is VMware. They do it all, but my favorite thing about them is they offer many products absolutely free of charge! A person can visit their appliances page and find hundreds of pre configured operating systems offering services such as web hosting, customer management, data backup, email servers, and much much more. Wikipedia has a large list of many other virtual machine software manufactures. If you would like to know more about virtualization or would like to find a solution for your business then please give us call at 404.819.9027 or send an email to sales@simpletechguy.com and we’ll do our best to get you out on the right track. Wanna learn how to get rid of Malware? It’s so easy to hack these days! Vtiger wont install error – You must specifiy a valid user name and password during installation. Copyright Marietta Computer Repair Information. All Rights Reserved.